Yesterday morning we headed over the Centreville, Md farm to meet the shipper who was taking a few of the horses down to North Carolina. 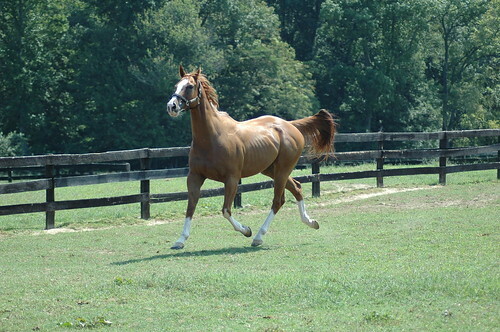 The market is booming for ottb’s in NC so it makes sense to keep a nice steady flow headed South. 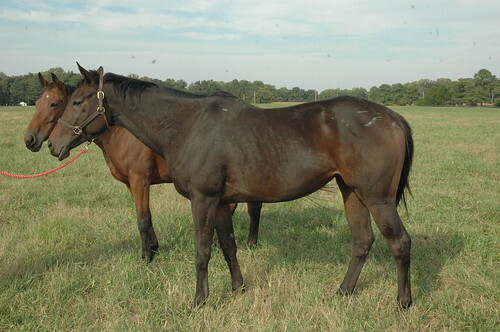 Track’s Protege, Fortheloveofrita and Malabar Daisy were the horses we sent down. I was supposed to send Canes Palace down but she caught a cold and then developed a fat leg so she wasn’t in shape to make a 8 hr trip. Instead, we figured we would send whatever mare we could catch. They all came up to us but it looked like Malibu Barbie aka Daisy was ready for a job. They loaded up easily and off they went. I wanted to check everyone out and had a bit of time to get on a few. I just picked a field and got on who I could catch. 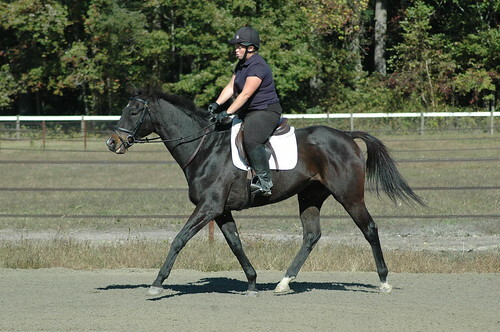 First up was Diamond H. Diamond is a super cool type of horse he is a 5yr and about 16.2ish. He is one of those old style guys with big bone, big chest, barrel and hind end. 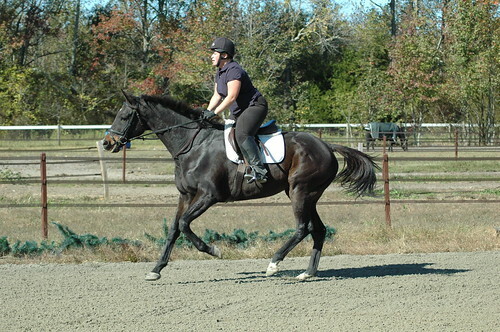 His trainer told me he has had a few out of Diamond (Diamond H’s sire) and they are all pretty big horses. Diamond H had a bowed tendon and he had a restriction on the ligament so we did a minor surgery to release the tightness of the ligament and he has been hanging out since June. He is a big puppy dog and just one of those horses who is an old soul. He stood there sleeping while we combed all the burrs out of his mane 🙂 We tacked him up and just headed right out to the big field to ride. I know it’s not necessarily smart to ride in a field full of horses but it’s what I had to work with and I knew Diamond was not the type that would care. He was so easy a grandmother could ride him 🙂 He was a bit short on his feet which are still a bit ouchy but felt pretty good to me. He didn’t care that I rode way away from his buddies way out into the middle of the field. He was kick along quiet just happy to go along with whatever silly stuff I was asking of him. 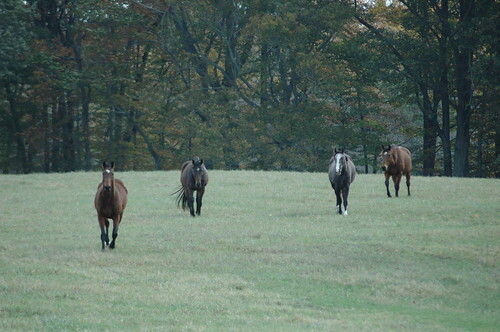 At one point, the horses all came running up and were following along behind him. Next up was Jacob J who is a new arrival. 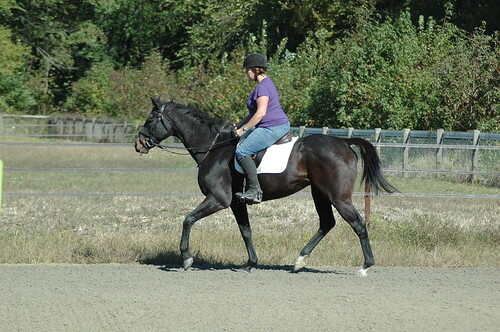 He was recently donated but has been off the track for a while but went back to the track to be a pony horse. The meet is ending and it was time for him to find a home off the track. He is a 7yr and so adorable. He was super friendly and had followed Diamond H down and hung around when I was tacking up Diamond like he was hoping to be next. He was really quiet to tack up but had that look in his eye like he was eager to go somewhere and do something. 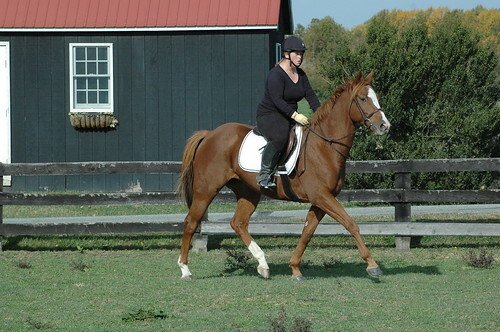 His owner had trail ridden him in fairhill and said he was really good so I was hoping. He proved to be excellent. 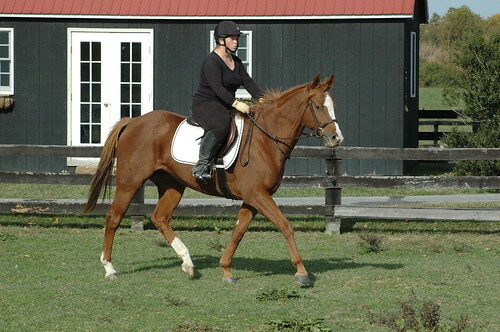 I rode him a bit in the small paddock to get a feel of him and then took him out in the field as well. What a cool horse! 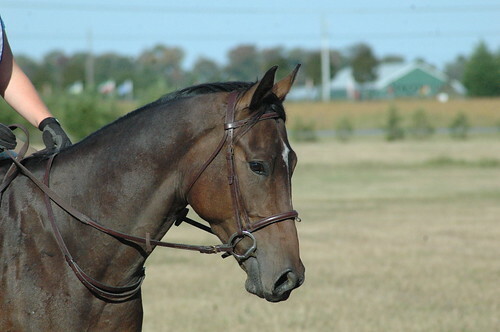 I think he will sell fast and being a pony horse he already rides western and neck reins. 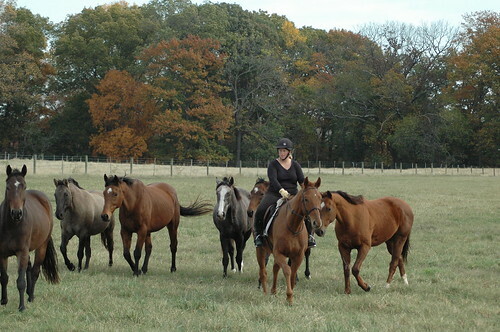 Those were all the horses ready to be ridden for that field so we headed to the other field. We saw Mort and thought he might be up for a ride but when I got on him it was apparent he wasn’t quite ready. He didn’t do anything bad but just didn’t want to amuse me with riding in his field. 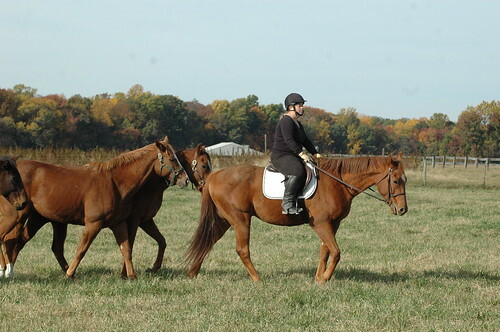 He does have a great mind as he demonstrated when the whole field came cantering up and then joined along with us. Bushy’s Yield is looking good! He was cantering around in circles and then spent some time picking up the mounting block and tossing it around. 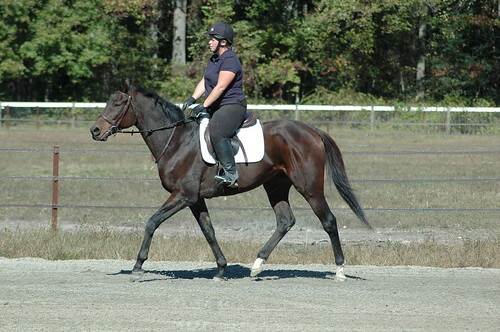 Bill is the lovely 2yr that everyone keeps emailing me about and I say he is not available yet. He is still growing and half the time I see him I think he looks kind of fugly but then he is pretty again. He will be stunning as a 3yr! Speaking of good looking horses check out Kiss a Monster in the far right hand corner of this pic. He was doing fabulous in his retraining but being a 3yr I thought he just needed a bit of a mental and physical break to grow up a bit. He looks so good right now. I wanted to bring him home but I think I will give him another month or two. He is a seriously fancy horse..just wait and see. I love spending time at this farm and think the horses are in absolute heaven. They are all so happy and it is so peaceful. I will write more about Sunday’s events tomorrow. I get tons of emails from people interested in Casey when he comes available. 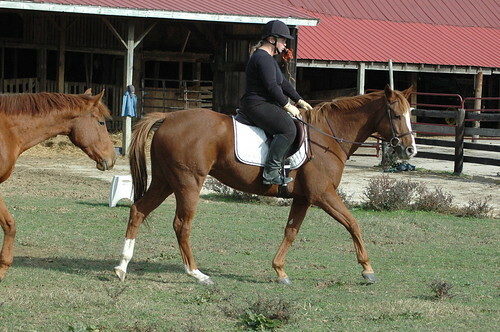 He is that horse that everyone wants- 16.2, chestnut with tons and tons of white, quiet and solid in build. 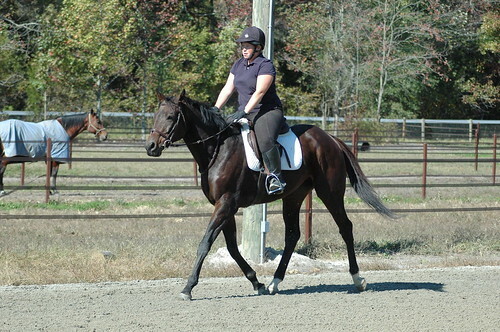 Looks more like a fancy warmblood than a TB. The one negative is that Casey tends to have challenging feet with long toes and low heels. He was at the layup farm but I brought him to my farm so I could have my farrier work his magic on him. We brought the toe back, added packing and pads and thought that would help. Instead, he seemed to get more uncomfortable. I was concerned there was something we were missing and it was making it hard to know which way to go without taking x-rays. X-rays can be a very scary thing for me as I swear each time we have done x-rays on one of the horses it has meant bad news for the horse. In this case it was great news! Casey’s feet look good and there is no sign of navicular, fractures or anything else. It gave us a great reference point of how much toe we can take off so we can make some more drastic shoeing changes. We believe that he is just sore because the sensitive lamina in the foot is being stretched due to the long toes. Magic farrier is out this morning working on Casey so we can get him comfortable again. When their feet hurt ,the whole body hurts so I really hope we can get him feeling better again. He is such a lovely animal and so kind. He is the horse that everyone wants. I know my phone/email box will be going crazy when he finally does become available. I know this sounds crazy but from the first picture I saw of Houndy there was just something about him that made me keep looking. 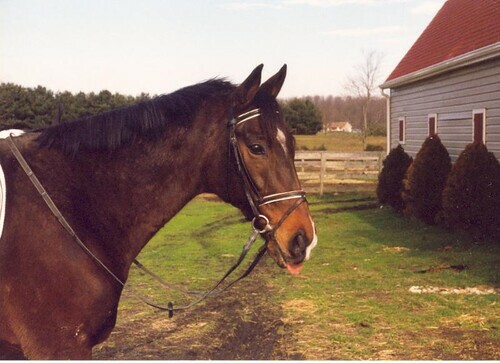 Then I realized it was because he so strongly reminded me of my older horse who I lost last year. They have the same face, same personality and same way of going. I was bringing in Houndy and Mack last night and they come walking up and I see that Houndy has a formation growing from his cannon bone..just lovely. Looks like he got a kick or something but nothing really open just a little scrap but a lot of swelling. My friend Melissa donated ice boots to CANTER so I headed in to get some ice for his icing. Ha, now you want to talk about one big baby of a horse he was it. He wanted nothing to do with me scrubbing the wound, touching his leg, putting on a boot and having ice in there. He lifted the leg sky high like I was killing him. I managed to get the ice in and have him believe he wouldn’t die. Mmm..just like my old horse used to do. He was the world’s biggest sissy when it came to any sort of injury. I had to convince Houndy he wasn’t going to die and to stand still. Meanwhile, I bring out Mack and start tacking him up. He always just hangs out sleeping while you work on him. He LOVES a good curry and was tilting his head and flipping his lip up for the currying. Houndy is over there looking at his leg every 2 seconds thinking I have seriously crippled him with this ice boot. Mack is back to sleep. I leave Houndy hanging on the crossties and head out for a ride on Mack. 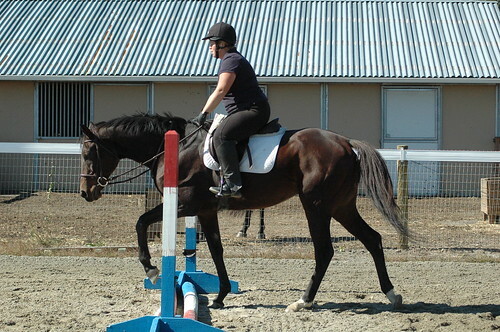 Mack is learning a bit about stretching into contact and we trotted a gate and some x-rails. No clue where his legs go but willing to give it all a try which is all that I ask. He has such a pleasant nature about him which I really can appreciate after some that tend to take every opportunity to be silly. I put Mack away and give Houndy a good curry as well. He loves all the attention being given and begs me for carrots. Have you seen his face??? Houndy has such a similar personality. He always greets me with a nice holler and he is quite silly to work around. Likes to pick up things and just has these eyes that are so full of life. He also has that relaxed way of going where he is never really in a hurry. You ride him and think to yourself it is no wonder he couldn’t run a little bit. He has these big long legs but hasn’t figure out how to use them yet. You get glimpses of the athletic nature and what he will be when it all comes together but you have to laugh at his awkwardness. He loves giving hugs and he just couldn’t be any sweeter. I have been feeling a bit down and out lately with everything that has happened but the CANTER horses do make me smile everyday. How can you not appreciate Mack who is this lovley 7yr who ran 50+ races making close to $100k and has just been foot perfect since he arrived. He has the cutest little head and is just such a good boy. He has perfect manners and is just so kind. He makes me want to hug him everytime I look at him and I often do 🙂 Then I have Shine My Shoes who is just such a cutie as well. I’m gearing up for a weekend of riding. 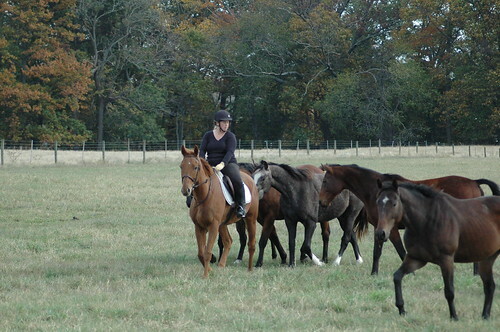 I think Kurt has recovered from last weekend so we should be hitting the trails again with all the horses. It has been a while since we have had a CANTER horse this slow 🙂 Houndy sees no point in being in a hurry to go anywhere. I had planned a weekend of trail riding for both Mack and Houndy to get them out of the ring and start to build some muscle. 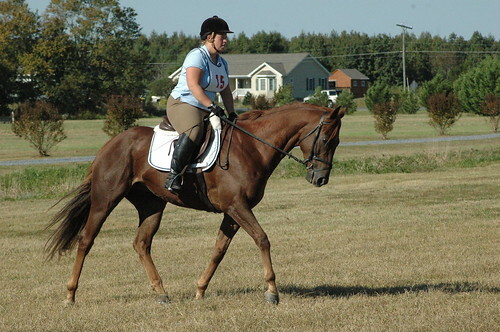 I can only ride so many horses and thought Kurt could ride Houndy out and about for me. Friday night we came home and I asked him to give Houndy a test ride to make sure he felt comfortable on him. Ha, in a few minutes he was happily cantering around with a grin on his face telling me how he had to push houndy along. Kurt is a pretty good rider but doesn’t ride very often so he flops around a bit and sometimes gets off balance but Houndy didn’t care. I took some video of Kurt putting him through his paces. Then he walked over to the jump standard and got the video out of the bag while sitting on Houndy and just dropped the reins on his neck to video me. He couldn’t get over how Houndy stood perfectly still. Here is some video of Houndy and Mack. Please realize that both Houndy and Mack were barefoot a week ago and are still quite foot sore and both are just getting put into work so they lack muscle. Mack is less than 2 months off the track after a long race career. I give this warning because sometimes people don’t understand what Tb’s look like when they come off the track and start letting down. They lose all that racing muscle and fitness and look a lot worse before they start to look better. You have to build muscle in all new places and start to build the fitness back up. These guys are moving nothing like they will in a few months from now but the BRAIN is what I look for. Both are super quiet, balanced, forgiving and kind. 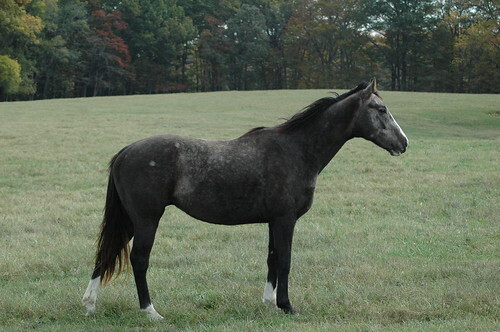 Saturday, we went to blackbird state forest with Junior (my connemara/tb) and Gracie, a clients cleveland bay/tb filly. Gracie is just learning to jump and the trails have all these nice logs ranging from 18″ to 2’6″ scattered through the trails. Kurt would lead and I just followed along on gracie. Kurt loves riding Junior which makes me super happy as Junior is an awesome lead horse. We had to cross water, wooden bridges, go past campsites and lots more and Junior is super brave. 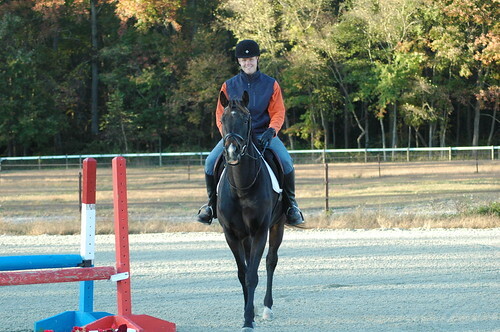 Kurt has started getting back into jumping now and was happily jumping everything on Junior. He said Junior is super smooth which makes him feel comfortable. We got back home and took Houndy and Mack out for a little trail and they were excellent! We rode right down the road and neither were bothered by traffic and then we got into the open corn fields and both of them happily trotted along relaxed and happy. I also got on the new arrival. 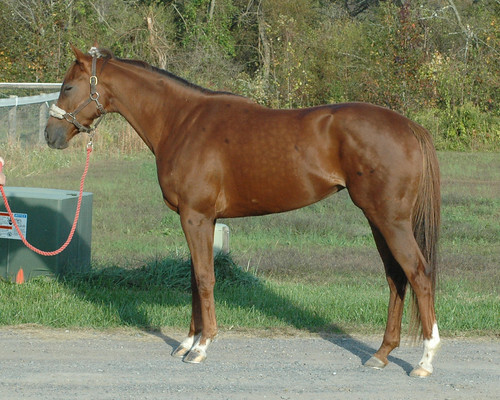 Canes Palace raced on Tuesday and we picked her up on Wednesday. She was donated but her awesome owner who has lovely horses. She is 16.1 as a 3yr and looks like she has some growing to do. She was super quiet and easy to ride. Quite impressed with her considering she raced this week and just shipped into a new place. She didn’t even look at anything in the ring. We headed back to the farm and got a little rest before the next trail ride with Houndy and Mack. There was a group of us that went out which was quite the test for a 2nd trail ride but once again our horses couldn’t have been any better. Mack led the way just as brave as can be and he is just super easy. Kurt was on Houndy who was way in the back w/o a care in the world. He doesn’t care if the whole group leaves him he is just hanging out. At one point, Jane’s horse darted through a patch of trees and Kurt said he was ready for Houndy to do the same thing but he just calmly walked on through the gap of trees. We had a nice walk/trot ride. 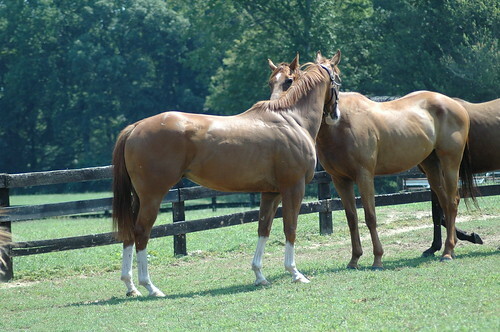 I have to say these are two exceptionally nice horses. Mack is a 7yr and you can tell he is just a total class act. He is so smart and he has seen the world and then some. 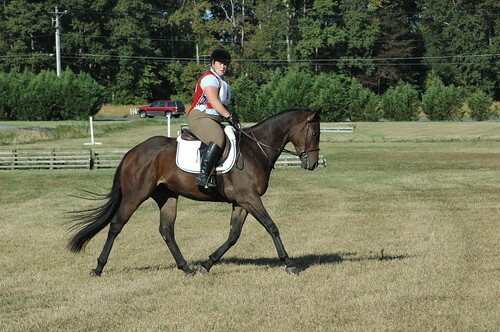 Houndy reminds me so much of my older horse when he was a youngster. He needs to learn to go more forward but he is super quiet and quite athletic. He still needs to figure out how to use his body but he will. It was a really busy weekend full of horses. We are taking the day off from riding today! Houndy, Shoes and Mack continue to be wonderful! I have decided that Mack and Houndy could compete for the slowest horse contest. Once again I am left scratching my head on how they get these horses to actually run because these guys are totally chill about life and slow as can be. You pick up the canter and are going along on a loose rein and they don’t want to canter more than 1/2 the ring before dropping back to a walk. Hilarious! 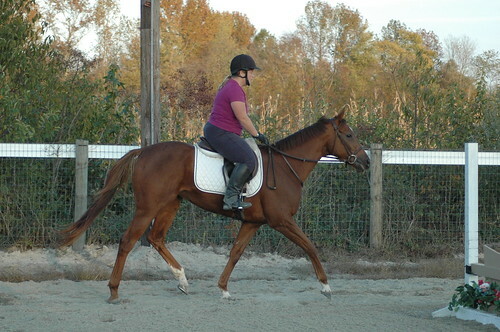 Shoes is just doing a bit of walk and trot as I want to build him up slowly due to the bowed tendon. It has healed great but slow and steady is always the best way to ensure that they come back to work and stay sound. I have introduced cavaletti’s and x-rails to Houndy and Mack. I find that small jumps are good for building hind ends. Both of them took right to it and are fast learners. I have also taken them both out for short trail rides and they were fantastic. You never know what they will do when you get out in big open fields but these two are exceptionally sensible with great brains. Not spooky and just truly classy horses. They are all so sweet with super personalities. 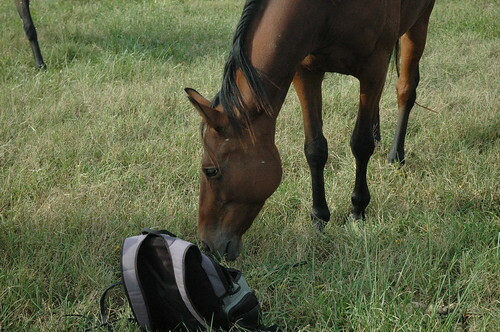 Shoes is probably the friendliest of the bunch and comes right up to you in the field and follows you around. He is such a cutie! One of the first things that I like to do besides teeth is get them worked on by the chiropractor. It can tell you so much about their body and really help them get comfortable early on in their work. She said that Mack and Shoes felt pretty good but Houndy needed a bunch of adjustments. Yep, exactly what I was thinking. They are all a bit footsore which results in their bodies being sore. It takes some time after you get shoes on for their bodies to feel better. Houndy is reluctant to go forward but when we jogged him after the chiro session he already looked more comfortable. Looking forward to the weekend when I can hit the trails. I would like to take Houndy and Mack out cubbing as well but want them to get a bit more muscle first. I was supposed to be at the Maryland Starter Trial today but Mobster knocked himself pretty good doing who knows what and is ouchy. Such is the life with horses! Oh well it is a gorgeous weekend and I have a bunch of stuff to do outside today. Friday, all the newly arrived CANTER horses got shoes on. Houndy, Mack and Shoes were all excellent for the farrier and I am sure they were grateful to have their shoes back on somewhat ouchy feet. I was so excited to ride them I couldn’t resist getting on them for a quick spin despite the chilly and windy weather. I just rode Houndy and Shoes on Friday night and both of them were perfect. I couldn’t believe how sensible they were in the windy weather and for their first ride in a new place. 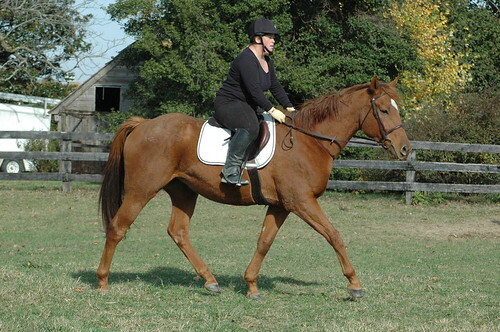 Houndy is kick along quiet and very relaxed to ride. Shoes appeared to be very well broke which is always nice to see. We got Houndy out first and what a testament to a good brain he is. The wind was whipping and one side of my ring is trees and corn. Even my horses are constantly spooking but he didn’t even bat an eye. Kurt was also dragging the ring with the tractor and at one point in time Hound and I met the tractor head on and that didn’t even phase him. The neighbors pool cover was flying up in the air and all sorts of other distractions. 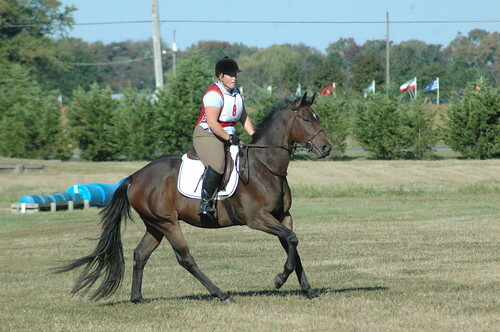 He was going around on a loose rein with me kicking to keep him going. 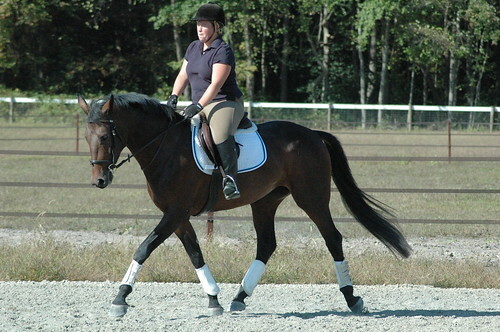 He is a big horse at 16.2 h but he doesn’t quite know how to use his body yet. 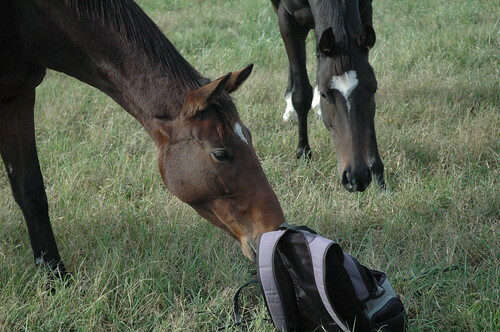 Very typical for most racehorses. Mack was next up and I figured it would be interesting to see how he handled everything. He is only a bit more than a month off the track however as a 7 year who raced for many years he has the temperament of a horse who has seen it all and then some. He has the best manners and is just so relaxed to work with. He was just so good out there and very willing to do anything I asked of him. He is still a bit body sore and lacking weight and muscle but that is to be expected at this point. When racehorses lose all that muscle they had they can look pretty rough. You have to build up new muscle but accept they may not look good for a few more months. I didn’t ride Shoes yesterday so no pics of him but I will get some soon. He is the sweetest horse and just loves people. I will be doing a lot of nice walk/trot hacks with all of these guys to build up their muscles and get them out on the trails. I had a 4 day weekend which was wonderful but absolutely packed with lots of horse related activity. Saturday, I headed up to Delaware Park for our weekly track visit. I absolutely love track visits although I can’t go nearly as often as I wish I could. I love the sight, sounds and smells of the racetrack and I really love all the interesting characters that make the track the interesting lifestyle that it is. We have built such a good relationship with the trainers and we spent a lot of time just catching up with everyone. Monster was so good on the flat!!! He was relaxed, happy and very confident. He doesn’t spook at anything and is just very brave about the way he handles it all. He put in quite a nice test for his limited training. 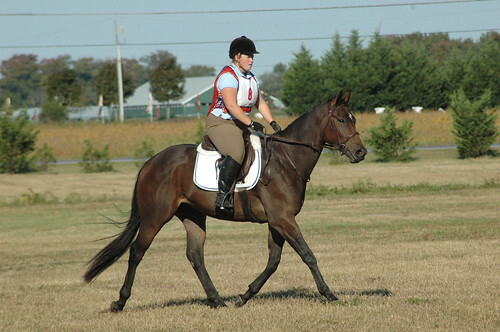 Mobster was in the BN division and put in a nice dressage test, great stadium and decided to remind me that 4yr’s can still be green even when they have been out and about a lot. There was a jump coming out of the woods and he wouldn’t even look at the jump but instead was intent on ducking the shoulder left and heading back to warmup. Ha, we had words and I got him back on the mental track. I forgive him because he is cute. My husband did an awesome job grooming and helping me keep them all going. He sent me off to course walk and had them all tacked and ready for me when I got back. 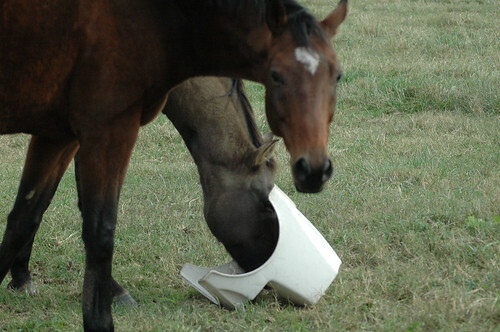 I have a bunch of horses in training at the farm and he is a true partner in helping the process run smoothly. He went back to the C-ville farm and I brought three back with me that I thought are ready to get going and sold before winter arrives. While I was over there I wanted to go have a brief look at the mares. I took a halter and lunge line out in hopes of lunging a few of them. Can I just say horses go feral when let out in big herds on lush pasture where they don’t depend on humans for food 🙂 Man, nobody wanted to be caught and Kurt and I were playing a cat and mouse game with them. Dee is standing behind Jada. Apparently they are now friends but looks like someone had to show Jada the initiation into the group..poor girl! I caught Wise Gold and started to lunge her. Wonderful Wise is the one following her around. OMG hilarious!!! Look at the crew that lined up to watch the lunging. I wanted to catch Malabar Daisy but no such luck! 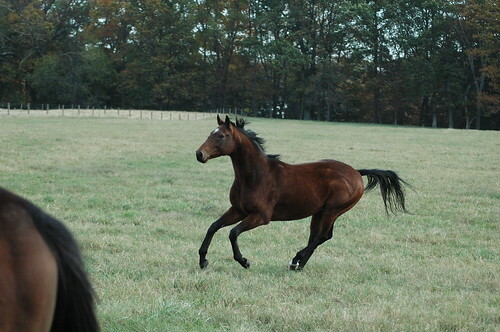 Kurt was trying to zoom in on her as we made them trot around. I had to go see Mort. Mort is the new love of my life and again he was the friendliest in that field. Letterman and Track wanted nothing to do with us so no luck there. He is very fresh off the track so a bit funky in behind but no worries. They all look funky. Speaking of funky the once pretty 2yr’s are looking very fugly at the moment 🙂 Horses in race training are well groomed and muscles in all the right places. You take them home and turn them out and all the muscle disappears and they just aren’t so pretty. Give them a few months and they will look great again but the process can be alarming to those who don’t know any better. Finally, we were ready to pick horses to take home. We basically took whoever we could catch. AllaboutMack was first up and he loaded like a pro and stood on the trailer without a peep for 20 min while we headed out to the other field. We decided on Houndy and Shoes. Shoes had his tendon ultrasounded and was looking ready for a job. They loaded right on and off we went. I settled them in with some grain and hay when we got home and started pulling their manes and clipping them up. 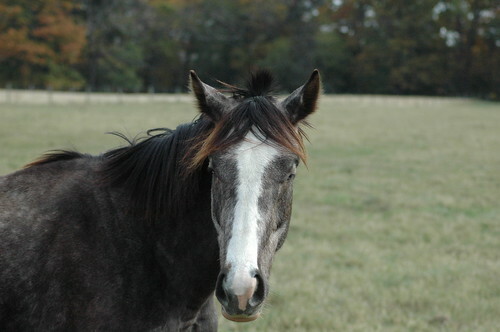 Shoes had a crazy mohawk going on so he got the clippers on his ears and bridlepath. Didn’t bother him a bit. 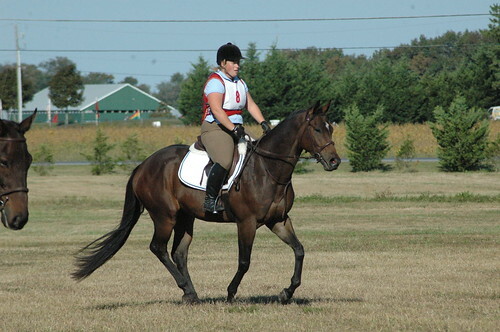 I pulled his mane while he stood nicely in the crossties. I went in the stall and pulled Mack’s mane while he ate his dinner. Haven’t gotten to Houndy yet but will today. Now I need to have the farrier get their shoes on and we will be ready to go. So excited!